A.S. Ramat Hasharon (D1) tabbed 31-year old American forward Amanda Thompson (185-87, college: Oklahoma). She started the season at Inter-Clube in Angolan D1 league. The last season Thompson played at CS Universitatea Cluj Napoca in league where in 20 games she averaged 11.0ppg, 12.1rpg (#2 in the league), 3.4apg and 1.6spg. She helped them to make it to the semifinals. She can count that season as a very successful as was selected to Eurobasket.com All-Romanian League Honorable Mention and League Player of the Week. In 2010 Thompson was drafted by Tulsa Shock (WNBA) in second round (19th overall). The former University of Oklahoma standoutis in her ninth season in pro basketball. Among other achievements Thompson received Latinbasket.com All-Puerto Rican BSNF Defensive Player of the Year award back in 2015. She is a very experienced player. And here thanks to pro basketball Thompson experienced life in five different countries playing on three different continents. She is familiar with European, Latin American and of course North American leagues. Thompson has played previously professionally in Austria, Israel (ASA Jerusalem and Hapoel Rishon Le Zion), Romania (ASC Sepsi SIC Sfantu Gheorghe and Alba Iulia), WNBA (Atlanta Dream) and Puerto Rico (Indias). Interclube won their third consecutive title, the 12th in their history, by defeating Saturday in Cidadela pavilion, 1 de Agosto, by 77-49, in the fourth game of the final of the National Senior Women's Basketball Championship, played in the playoff, the best of five matches. At the interval, Interclube had an advantage of 25 points (47-22), thus setting the final by 3-1. Interclube had already won the first two challenges, by 62-53 and 60-37 respectively, while 1 de Agosto triumphed in the third, by 74-71. 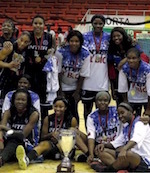 1 de Agosto team last Wednesday in Cidadela multipurpose pavilion, in Luanda, beat Interclube by 74-71, in the third game of the final of the senior female National Basketball Championship, being disputed in the best of five games playoff system. By half time, 1 de Agosto were losing 32-34. The playoff result is now 2-1 with advantage to Interclube. 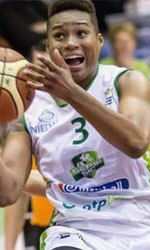 Interclube won the two previous games by 62-53 and 60-37. The next game is scheduled for Friday evening in the same venue.